Speciality: Bottled beer, 66 varieties! 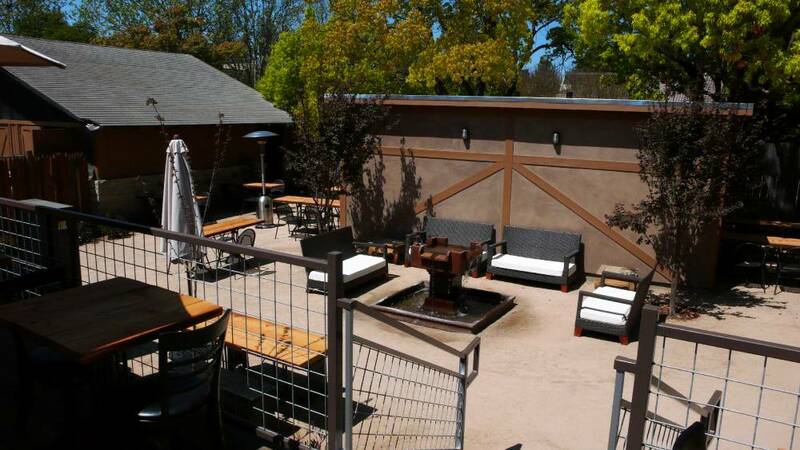 Having already sampled the fare and the brews at Hop Monk’s newest location, in the town of Sonoma I was anxious to check out Dean Biersch’s first brew pub in Sonoma County after selling his interests in the Gordon Biersch Brewery Restaurant Group in the late 1990’s. 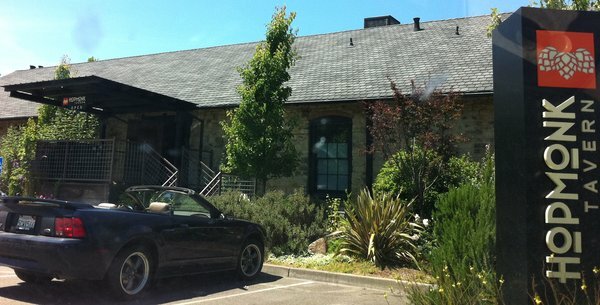 Would the food and the service be as excellent as experienced in Sonoma? First, the space the Sebastopol HopMonk Tavern occupies was the former home of the Sebastopol Brewing Company which, was as forgettable of a brewery/restaurant that I can remember. But, the building itself, a 100-year-old stone landmark which was once the powerhouse for the Petaluma & Santa Rosa Railway, an electric railroad that once served Sebastopol is pretty cool. With some updates to the interior and the back outside patio, (beer garden), Hop Monk Tavern made some much-needed improvements. Since it was a crisp, clear day and lunch time, hubby and I decided a table outside (like we did at the Sonoma location) was called for. The friendly hostess led us to a cozy table on their elevated deck over-looking more tables below, water fountain feature and stage area in the corner. All of the patio area was covered with a heavy-duty, clear plastic canopy to ward off winds and may be even rain? Climate control. So far, so good. Staff is friendly and attentive; just like Sonoma. Menus were identical which, you would expect. Why change a good formula? But, was the food itself as good? That can be tricky when you are running 2 places. 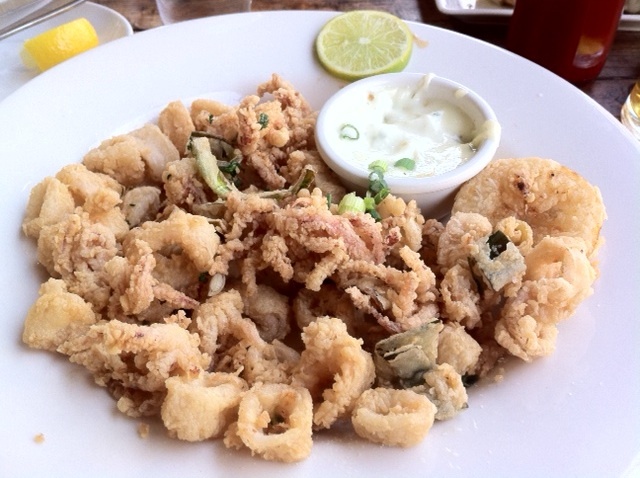 If you read my review on HopMonk in Sonoma, you will recall my interest in their burgers that I wanted to try along with my love for all things calamari. Now, with this second opportunity at hand, I just had to try them so, I ordered the Burger Sliders ( $10.50****) served with tomato chutney, lemon aioli, shallots and topped with white cheddar cheese – 2 generous, 4-oz each Angus beef burgers cooked to medium well perfection. This was really enough of a meal for me and very delicious but, I had to sample the fried calamari. Crispy Calamari ( $11****) with lots of “feet” (tentacles) and rounds of the tubes; fried perfectly with a golden color — they were delicious. Hubby decided the special sounded too good to pass up. Hot Beer Sausage and Mustard Mash ($10.50**** ) a Caggiano smoked sausage made with Lagunitas beer and a red cabbage and apple slaw on the side. The sausage was very tasty but the potato mash was fab; topped with a Balsamic reduction that had formed a slight crust. Yummy and, the slaw was crisp and flavorful. After polishing off this great meal, we moved inside to the bar for coffee. The bartender extended the dessert menu and though I wanted to checkout Death by Chocolate, ($6.50) after listening to his description of it being generously sized; I choose the house favorite, Bread Pudding ( $6.50***) which, he told me was smaller in size. My readers may recall I am not a big fan of bread pudding but, I know many people are so, I decided to give it a try; besides, by ordering this I was fairly assured I would not eat a lot of it! OMG! It arrived and my mouth fell open. It had to have weighed 2 lbs. Okay. Maybe not that much but good grief, Charlie Brown—-me and what army was going to eat this? Hubby is not a dessert eater! I quickly recovered but not before commenting to the bartender, “My heavens, and this is smaller than Death by Chocolate?” Anyway, it was very good served with whiskey cream and brown sugar sauce. I commented to the bartender that I thought the two restaurants showed a lot of consistency in their food and service. Who exactly was the executive chef mastermind behind all this? Chef “Billy” Reid came the reply. This must be one of the busiest chefs around — traveling back and forth on Hwy. #12 between Sonoma and Sebastopol all week, making sure things go smoothly and food is being turned out correctly. His efforts are your benefit! This guy knows what tasty food is all about and how to keep 2 kitchens humming; kudos as well to the front of house management for training wait staff well, too. It’s so nice to go to a place and feel welcome, noticed and appreciated. A winning combination. Gee, don’t you wish more restaurants followed that plan? 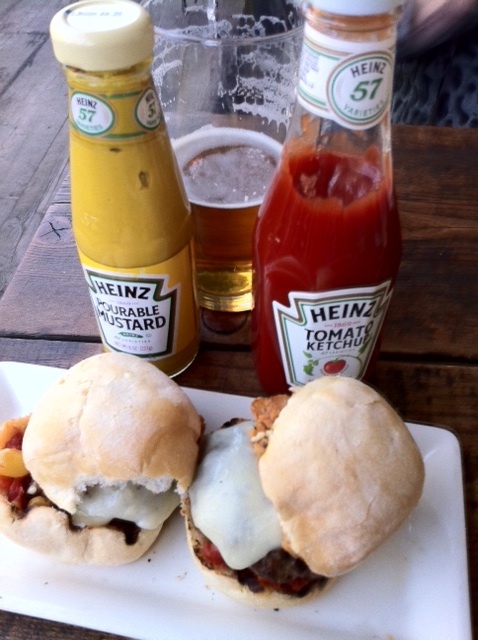 Get Thee to HopMonk Tavern in Sebastopol or Sonoma for some very tasty food and some great beers. Decent wines and cocktail offerings, too.